Cake pops are all the rage. I have made them a few times with allergy-filled ingredients, but I thought I could make this a great bite-sized allergy-free treat for the kiddos. But I'm still on my mission to find the perfect Top 8 free (white) cake. So I tried a new recipe which turned out pretty good. Still not as good as the real thing, but getting closer. 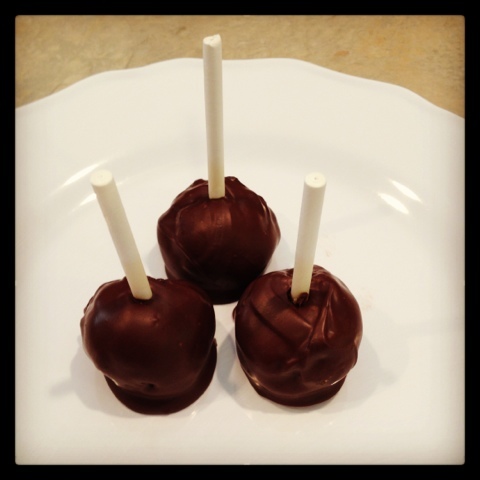 I wanted to try three different kinds of cake balls to see which was the favorite. One was mixed with buttercream frosting, one with dedicated peanut-free almond butter (I used Barney Butter), and one with soy butter (I used Wowbutter). For the almond butter and soy butter, I microwaved it for 30 seconds to make it easier to mix. The favorite was the one mixed with buttercream frosting, but the others were good too. It just depends how sweet you want it!